In 2000s, a series of small cafes opened in different locations on campus. Nollen Café is located on South Campus while Cyber Café is in the library and Deerpath Café is on North Campus. The picture characterizes school’s continuous effort to offer students places to hang out in a variety of spots on campus. 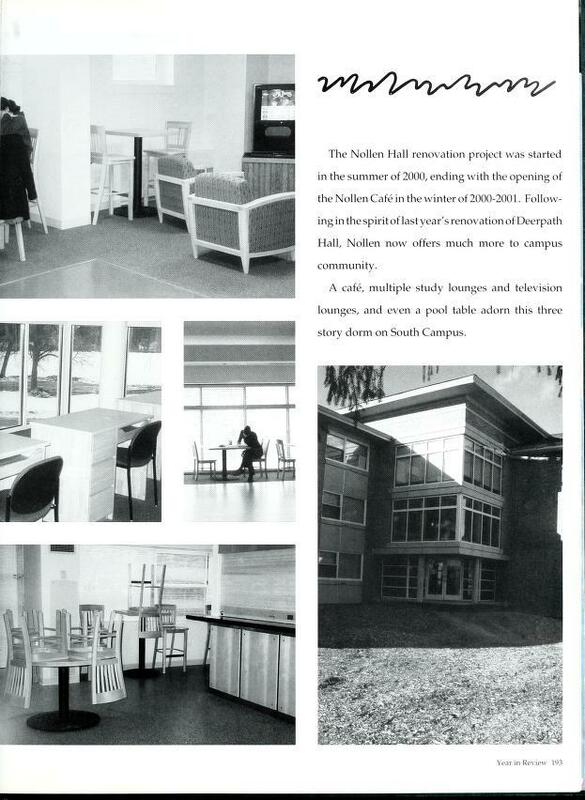 The new Nollen Hall included not only a café but also a study lounge and even a game room. The installment of cafés enabled students to use their flex dollars to purchase coffee, tea, and other beverages as well as light snacks, which allow students to utilize their meal plans in more flexible manner. The most recent café built was Boomer’s South Café at the new sports center. Newly opened cafés allowed students to have more pliable options on their meal schedule and places to hang out.